Life is a never ending journey filled with twists and turns. For me, these few weeks are a wonderful episode of discovery and joy as I get to spend time with a newly adopted grandchild. It has meant a pause in my ability to stitch as I am across the country from my Bernina but, there are still moments for creativity and inspiration. One luxury of this respite has been the time to explore some of the many sites that constantly flow through my inbox with tantalizing options for further viewing. The Metropolitan Museum of Art is constantly tempting me as they offer members some wonderful online viewing options for their exhibitions. This year they have created a series called 82nd and Fifth, where they are presenting weekly clips by museum curators on how works have inspired them. I would encourage everyone to subscribe - you don't have to be a member for this series. The clips are only two or three minutes long - a real asset if you are looking for quick shots of inspiration! 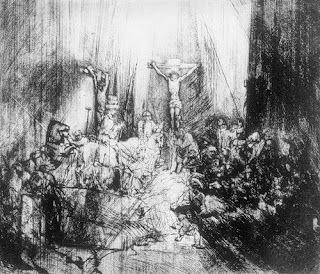 As an example: in one episode, Nadine Orenstein discusses the 1653 work by Rembrandt, Christ Crucified between the Two Thieves: The Three Crosses. For Ms. Orenstein, "a great work of art goes beyond the image that it is depicting." This particular work is one of Ms. Orenstein's favorite and she knows it intimately. In her brief vignette she discusses Rembrandt's use of simple lines to show emotion and his uncanny ability to use light and shadows to captivate the viewer. Bruce Schwartz's very effective photography dramatizes what Ms. Orenstein is summarizing in a little over two minutes. You really need his close up photography to catch what Ms. Orenstein has discovered. Simply looking at a jpg of the entire image doesn't do it. I hope you can find the time to enjoy their exchange. Their vignette will send you off for the day with some new thoughts on how to view people and perhaps portray emotion in your own works!